Choosing the right place to pitch is important when camping with kids. You have to carefully select an area that is safe for them. Following Leave No Trace principles, you don’t want to have to move rocks or alter the landscape in any way. Good sites are found not made! Children love to roll in the hammock and when in deep sleep, there is a possibility of their falling off from the hammock. This cannot be avoided completely, but you should be careful of how high you hang the hammock. Remember to only hang as high as you’re willing to fall. It should also be easy for the little one to enter and exit from it. The hammock selected for your child should be durable. Double check the hammock beforehand for any small rips or tears. With any tossing and turning, they could rip completely overnight. Always test the hammock out before letting your kids in it. 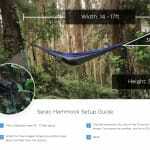 Read the safety and setup instructions very carefully if using the hammock for first time. 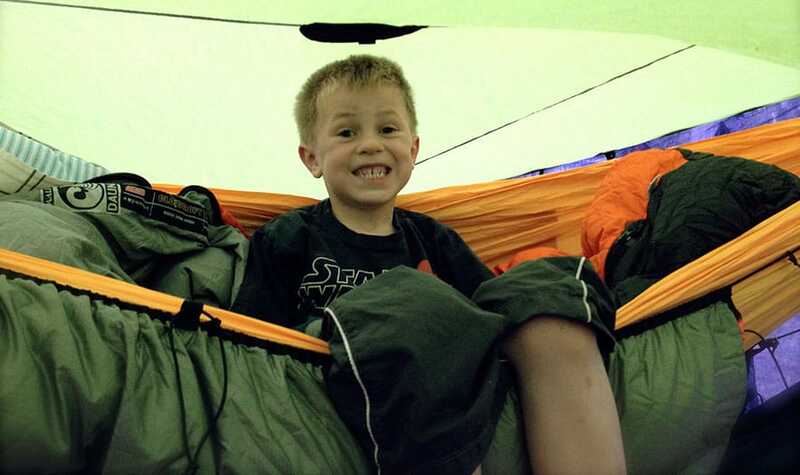 Parents usually complain of having restless sleep during the camping trip because they’re afraid of their child either falling off from the hammock or whether they are warm with the proper insulation. Some tips to help you sleep better below. Since top quilts don’t work very well with children – they love to toss and turn. 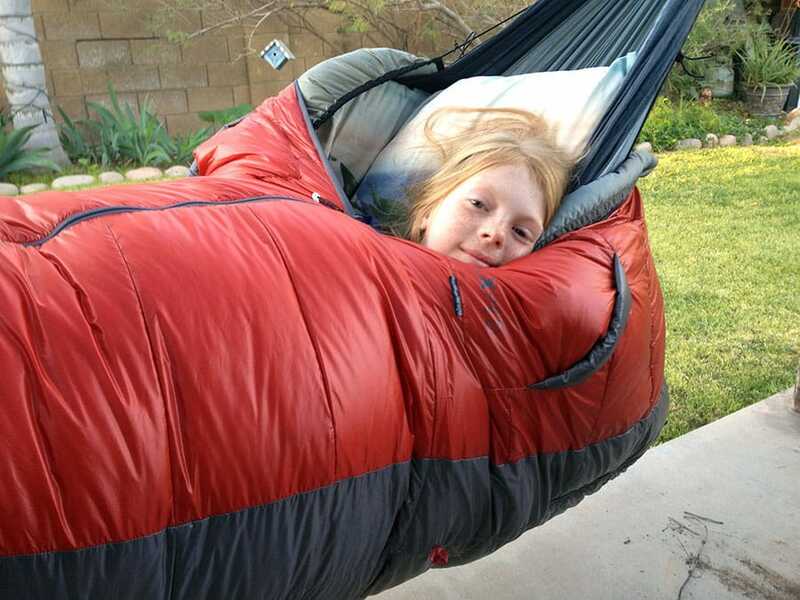 Sleeping bags are best to solve the purpose by keeping them tucked in and warm throughout night. If using under quilts for children, try using quilt hooks which will secure the quilt with the hammock and avoid sliding it at night. If you feel the weather will be too chilly, slide a pad inside the sleeping bag or hammock which can act as a perfect insulator to avoid getting cold. Some sleeping bags even come with a sleeping pad sleeve for just this reason. Camping trips may involve unwanted attacks by bugs. You can use attached bug nets which will keep your child safe from bugs and may even prevent them from tumbling out if they toss and turn. Get a tarp that will fit the hammock perfectly and this will keep them dry and away from the elements throughout your trip. Once the hammock is setup and all the necessary things are in place, it is time to enjoy and have fun with your children. By following some simple measures you can enhance the experience of camping and add an extraordinary trip that your child will never forget. You can also choose bright and colorful quilts for children, to make camping more colorful and exciting for them. Using battery operated lights strung from hammock ridgelines can also be used while camping to spice up the area. Children can carry their favorite books and sleep under the star studded sky. This camping trip, let it be their best experience ever. 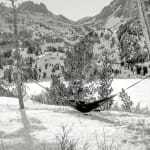 This entry was posted in Tips and tagged Backpacking, Camping, children, hammock, instructional, safety.